Bree Welch is excited to return to the Alley Theatre, where she previously appeared as Belle/Mrs. Fred in A Christmas Carol. 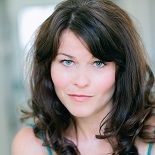 Bree is a graduate of the Old Globe MFA program, where she was directed by former Artistic Director of the Royal Shakespeare Company, Adrian Noble in King Lear, Inherit the Wind, The Madness of King George III, and As You Like It. Other Old Globe performances include Taming of the Shrew, Richard III, The Winter’s Tale, Two Gentlemen of Verona, The Country Wife, and Dividing the Estate. Houston credits include Stages Repertory Theatre: Who’s Holiday (Cindy Lou Who), The Man Who Shot Liberty Valance (Hallie), Who Am I This Time & Other Conundrums of Love (Kate), and The Rabbit Hole (Izzie). Classical Theatre Company: Henry V (Henry V), Antigone (Antigone) and Triumph of Love; Main Street Theater: The Revolutionists (Marie Antoinette), The Secretary (Lorrie); Houston Shakespeare Festival: Hamlet (Ophelia), The Tempest (Miranda), Love’s Labour’s Lost (Rosalind), Titus Andronicus (Lavinia), Julius Caesar (Calpurnia), Cymbeline (Queen), Romeo and Juliet (Lady Capulet), and Measure for Measure; Unity Theatre: Miracle on 34th Street, The Odd Couple, Enchanted April, The Heiress. Work in Europe includes Prague Shakespeare Company: As You Like It (Celia), Mary Stuart (Queen Elizabeth), Twelfth Night (Maria), Cymbeline (Queen), Into the Woods (Little Red), A Midsummer Night’s Dream (Hermia), Macbeth (Lady Macbeth) and the U.S. tour of PSC’s Twelfth Night and Macbeth at Main Street Theater. She played Mrs. Elton in a staged reading at Lincoln Center of the musical Emma, A Romantic Comedy, directed by Tony Award Winner, Jeff Calhoun. TV/Film credits include: The Ottoman Lieutenant (with Ben Kingsley), Crossing Lines (Netflix), Dinner with Strangers and Hit Men. She also graduated from the University of Houston School of Theatre and Dance.